Carrie Turino-Shipma joins the Cavalor team to cover all of California and Las Vegas, Nevada. One-on-one consultations, group, club and barn demos, as well as dealer expansion are among her priorities in the new position. Carrie brings almost a decade of experience from the high end saddle industry with Stubben and CWD and the equine nutrition industry with Innordic USA. She is known by her customers for her warm personality, reliability, and top notch customer service. Carrie’s passion for horses started at a young age, and as a young adult she participated in hunter/jumper shows. 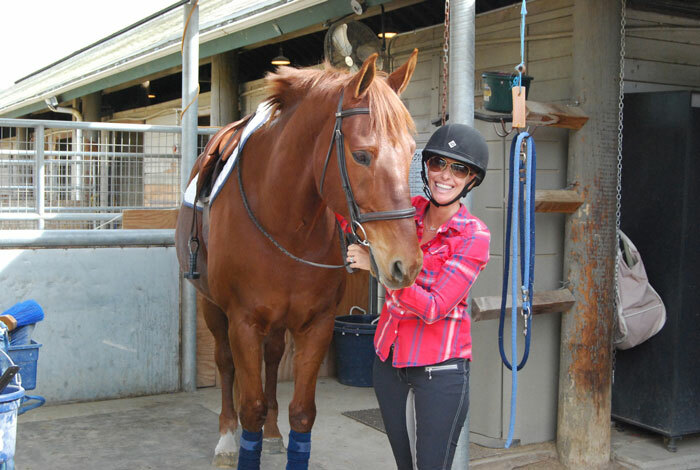 Carrie lives in Orange County with her husband and son and rides her beloved horse, Rusty, regularly. Cavalor is a global brand that can justifiably be called the world leader in equine nutrition for high-performance horses. Cavalor products are available in more than 50 countries worldwide and are used by champion riders. Cavalor offers a complete line of horse feed, supplements and care products. All formulas are the result of years of intense research and development, thorough testing, selection of the highest quality ingredients, and strict manufacturing and quality control processes. The company’s values are: Innovation – Quality – Results. 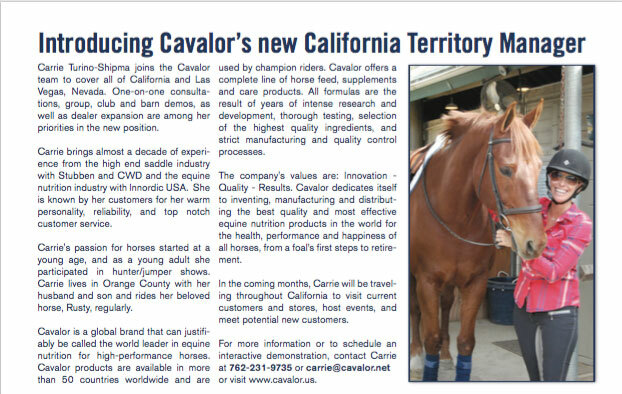 Cavalor dedicates itself to inventing, manufacturing and distributing the best quality and most effective equine nutrition products in the world for the health, performance and happiness of all horses, from a foal’s first steps to retirement. In the coming months, Carrie will be traveling throughout California to visit current customers and stores, host events, and meet potential new customers. For more information or to schedule an interactive demonstration, contact Carrie at 762-231-9735 or carrie@cavalor.net or visit www.cavalor.us.